Needles: 4.5 mm for in-the-round and right side rows, 4.0 for wrong side rows when knitting flat. I purl looser than I knit and this yarn shows that well. Oh, and a cable needle. A cable needle is needed for this, yes. Started in September, finished in February, photographed in August..this is an all year sweater around here, for winter days by the fire and summer nights at the shore. When the fog rolls in the hood comes up. The hood fits incredibly well and I use it a lot. A little button keeps it better in place when it is down. I lengthened the body and the sleeves quite a lot, about 10 cm/4 inches or maybe even more for the body, redrawing the bottom cable of the body to make it more proportional. The sleeves are knit in the round up to the sleeve caps, and instead of hems I used a provisional cast-on and added an I-cord edging, an idea from Desiknitter. The stockinette part in the front rolled a bit in the beginning but is now nice and flat. The pattern is written well and covers 19 pages! so most of the info is in there but check out the tools and techniques section at the designer’s website too, for some of those special increases. 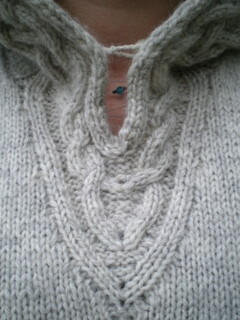 To begin with the yarn pilled a little on the bottom of the sleeves , but after some wear it seemed to stop. 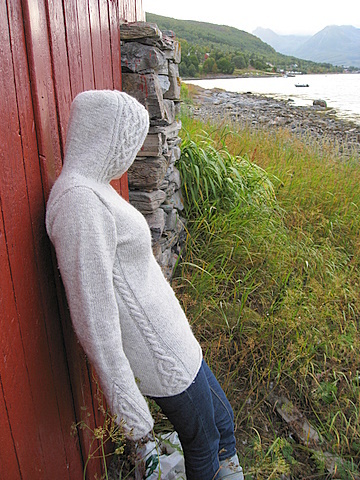 My first experience with vamsegarn, a really nice yarn for this project, squishy, warm and with good cable definition. Enough tech talk. I’m waiting for winter. Problem Challenge one: Sleeves to short. Solution: Knit them longer. (Yeah, I need to be spoon fed sometimes. Sorry about that). Thanks to Emilly and the Yarnerina for great advice in the last post. I should now be able to estimate the right length before starting the sleeve cap. Challenge two: The incredibly crappy stockinette I get when I knit back and forth. 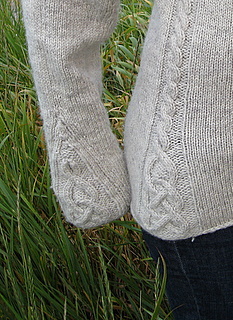 Solution: Use different sized needles for k and p rows, OR knit the sleeves in the round. 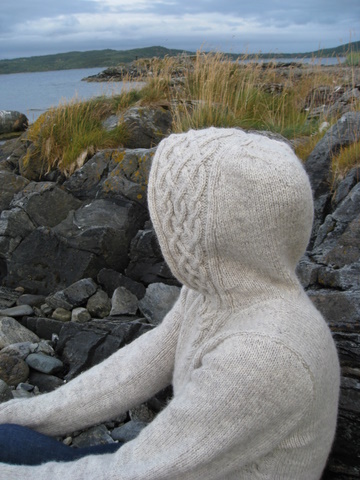 I admit that I have never really fully understood why you would knit something flat and seam it up if it can be avoided. Rogue was planned to be my first “flat sleeve”project, but at the moment I am very far from my needle sortiment, and a yarn shop, and I only brought one size of needles with me. If you know a good reason why I shouldn’t knit the sleeves in the round up to the cap, speak now or remain forever silent. I haven’t started them yet. 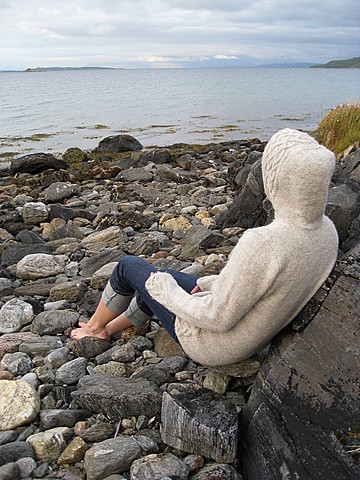 I started the body instead, which brings me to challenge three: I want a longer sweater than most Rogues I’ve seen, and several knitters have noted that it came out on the short side. Desiknitter did a great job lengtening hers, and also solved another dilemma I had as well. I did not like the visible edge created by the hem, and was looking for a lighter edging. Applied I-cord it is. I learn something new from knitblogs every day. Thanks everybody! The ingenious thing about Rogue is how it’s cables create the waist shaping. By lengthening the body, the side panel motif would come further down, and the shaping start at the widest point of my hip, not further up where I kind of have a waist. So. I figured I should extend the widest part of the cable, and not the narrowest. Like this – instead of this. I managed to pull out a few rows of chart A that with the help of two set-up rows would work as a pattern repeat that could extend the cable downwards for as long as I wanted. The sketch shows the original design on the right and the extended version with one extra pattern repeat on the left. What I like is that it makes the sidepanel motif larger and more substantial than the sleeve motif, which I think makes sense, and adds some visual “weight” (does that even make sense?) that will hopefully be a good balance for the large cabled areas around the neck and hood.